This is my photo of Santa at the end of the Macy’s Thanksgiving Day parade. What is he so happy about? He seems to be swinging up his arms in jubilation at the suffering he has wrought with opening the holiday season. Hey, Mr., you got elves to help you!! How about sending some of those cuties over to my house? Or, better yet, a masseuse named Sven? His presence indicates that it is time to rev our engines. Vroooom. I know that your list is as long as mine is. On top of our regular obligations, we have all the other fun stuff. Cookie making, holiday card sending, present wrapping, post office line standing.....bah humbug. I am going to make life easier for you with my tip for the healthiest holiday EVER. 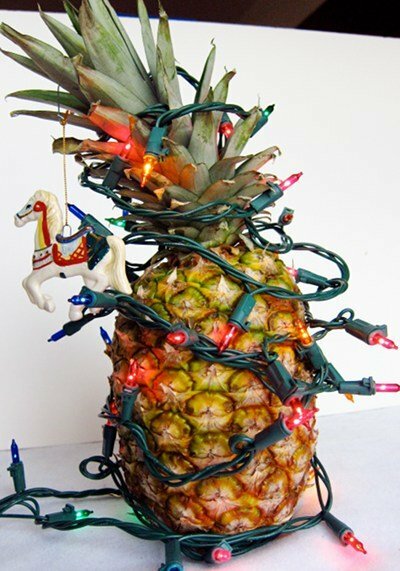 On December 25th, undo the lights and have yourself some fresh pineapple. Your Christmas pineapple serves two purposes, decoration and snack (not unlike those candy covered gingerbread houses). I just saved you a bunch of money, time, and you get to feel good about your environmentally savvy choice. Actually, my Christmas pineapple is a symbol of letting go. Can’t get to the cards this year? Breathe! The latest toy sold out at Toys-R-Us? Count to ten. Don’t have time to decorate the tree? Buy a pineapple. I am guilty of creating a vision of how I want to holidays to turn out. For example, I brought my children to NYC to see the big parade (hence the photo). At the end, my daughter informed me she liked it better on TV. Here I was, intending to give her the gift of the biggest holiday parade LIVE and she liked the small box version. Oh well. What really matters is your attitude. This year just smile at the overwhelming pile of stuff you are supposed to do - and just do the stuff that really matters to you and your friends and family. How do you deal with holiday stress? "I am guilty of creating a vision of how I want the holidays to turn out." Amen, SG. Me, too. I have learned to stop, breathe, and let go. My New Year's resolution the last few years has been one word... SIMPLIFY. It's been my mantra and it's helped. The reason we have Christmas is to celebrate the birth of Jesus, and give thanks to God that He loved us enough to send His Son to this earth in such a simple, lowly way. Whenever I get too overwhelmed with Christmas or any other holiday or event it's usually because I've gotten too wrapped up in "stuff" and haven't spent enough time just, as you said, stopping to breathe. I pray for peace, for clarity, and for a renewed perspective, and then start making a list. I write down what I want to do, what I need to do, and then start delegating and/or getting rid of whatever it is that's not absolutely necessary. I have a renewed peace about me, and it's literally a Godsend every time. Merry Christmas to you, and thank you for the reminder to keep it simple! Well said, Snack Girl! Wishing you a stress-free end of the year & a bright & shiny new year! So true! I planned to make 20 ornaments to give my music students - didn't happen. Instead, I printed a Holiday search and find - they LOVED it - and all I had to do was print 20 pages! Well, we've decluttered the holidays a bit. We have agreed with two sets of relatives out of three that gifts between adults are not necessary. Everyone would rather buy themselves the stuff they want, so they save their money and do just that. Only gifts to children are important to us. The third side of the family is quite small, so our christmas gift list consists of four children and two adults, pretty much. That saves tons of time shopping. When we travel for Christmas (every other year) we do not bother putting up a tree. I have been sewing reusable bags out of Christmas fabric to make wrapping presents easier. The family loves them, even though they are extremely basic in form. They are more expensive than paper, but only the first few times you use them. We do not have tons of parties during the holidays--either to attend or to throw. We're not precisely party people. It's more about visiting family than anything else. There are a couple of events, but not that many. I got such a kick out of the pineapple with lights last year that I did it again this year -- the kitchen counter decoration. It think it's a hoot! I've cut my cookie baking way back. Only two types this year; the families most favorites. Also, less temptation for me/us to eat too many sweet things. For my Christmas Day buffet I have had in-laws offer bring a roasted turkey(! ), I'll make my stuffing, served along with homemade cranberry sauce and a dab of mayo on bulkie rolls, and we'll be eating these sandwiches usually reserved for the day after Thanksgiving. Also, my creative energy will be going into an antipasto platter. I'm pleased with cutting back. Family, in-laws and grandchildren are what make my holiday fun. And, a Yankee Swap -- $20ish gift; always fun! Haha!! Great one! Such common sense and yet we tend to forget what's important at this time of year. Be thankful for all your blessings and forgive your shortcomings. Happy holidays, everyone!! I think everyone is entitled to spend the holidays as they choose. I have found, though, that many people enjoy giving to others whether they are adults or children. We are all children inside. This can be a lonely time for some people and there are people in need throughout our own countries. This is a good time to make an extra effort through petition or a donation no matter how small to a cause or charity we feel strongly about. These gifts can be made in the name of a relative or friend. At home, we are reminded that the reason for the season is the celebration of Christ's birth. We try to keep this in the spirit of giving for those who have had hard times or not. Most of all, we hope to show kindness to others, we can afford to do this. All these things we found to be rewarding and . . . stress relievers. Merry Christmas all! We actually have no room for a Christmas tree. We have simplified a lot!! A few Christmas tree branches placed artfully in a huge vase and then decorate. Place on the buffet. Voila Christmas!! Have simple decorations on the fireplace Mantel, simple but beautiful. We have a really big extended family that likes to get together for Christmas (about half of them on Christmas Eve and the other half on Christmas day). If we tried to do something for everyone, I'd be run ragged! Luckily, my husband's side agreed on drawing names. You get one (or a few) nice things for ONE person, instead of everyone. It's a great way for us to connect, but it is reasonable enough that even the college kids can participate. On my side of the family, we just get together for Christmas breakfast and stockings. We all get a little something to put in everyone's stocking and it makes the event a lot of fun. The kids are the main focus and get more presents than the adults, but it works out really nicely and we don't feel so strapped this way. We also potluck both meals, so the hostess doesn't have to stress either. The holidays are so much less stressful this way! p.s. Love the pineapple idea! Thanks for the smile, I love that pineapple! I started a little earlier this year and ordered alot of items on-line. If you pay alittle more you can have things wrapped for you. The lights took a little longer but with my husbands help we got them up. The only thing that's saddening me is that my son will be away at basic training for Christmas but we intend to love the heck of of our daughter-in-law and grandkids. Happy Holidays to all! Thanks, I just shared that picture on my Facebook page.!!! Have a pineapple sitting on my counter, but I think we'll eat it instead of decorating it. 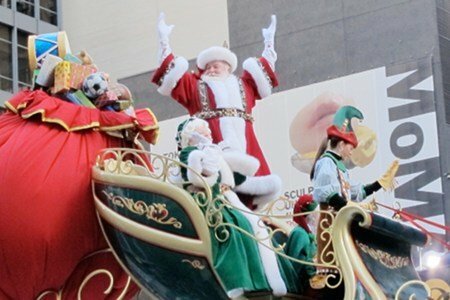 FYI - I took my kids to NYC last Christmas -- FAO Schwarz and to Rockefeller Center and what do they remember? "Mom, did you see all the different kinds of dogs people have in the city?" Merry Christmas! Thank you for this! I am letting things go left and right, but still feel a teeny bit guilty. Uhh, not any more!! Had an open appendectomy two days prior to Christmas and it has forced me to simplify and enjoy the true meaning of Christmas. Friends and family showering me with love and listening to Christian Christmas music and reflecting upon my blessings.